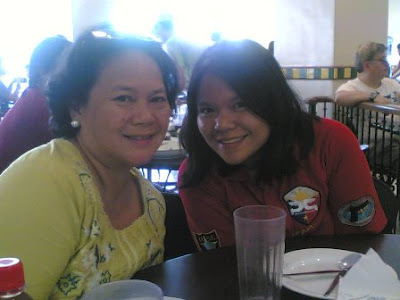 One lazy Sunday, my sister Gelli asked my mom if we could eat out before we (my mom & I) head back to La Union. My mom right away obliged and we headed off to Amici, her restaurant of choice. 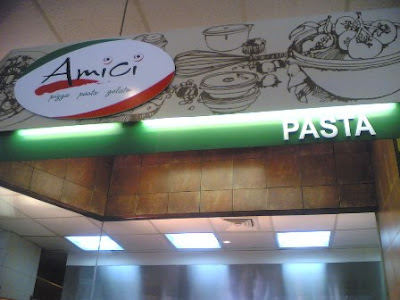 According to my sister, Amici, which means "friends" in Italian, serves pizza, pasta,gelato and more. The restaurant had a "cafeteria" feel to it. A high end pizza place it is not. There was an air of casualness upon entering the restaurant. People were eating, laughing and talking animatedly. While others lined up to place their orders, some people watched the cooks prepare pizzas. I, on the otherhand, joined the long queue at the gelato scooping station to check out the yummy gelato flavors. We were ushered to our table and were given menus right away. 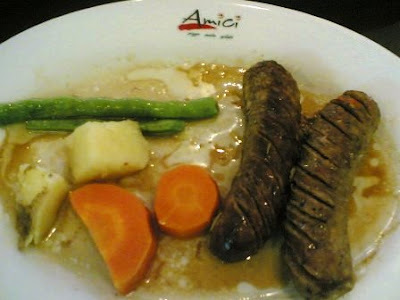 Since it was my first time at Amici, my sister ordered for me. She ordered the Spinach Fusilli, mozzarella sticks and a pizza margherita. My mom ordered the italian sausage. 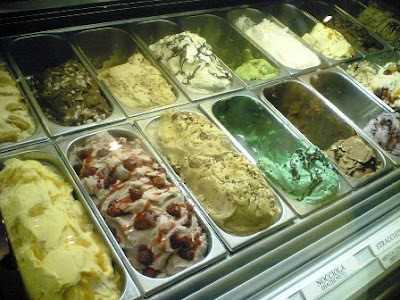 Gelato for dessert. The mozzarella sticks were okay. A little bland but okay. The marinara sauce needed a dash of salt and pepper. Or maybe they should have used italian breadcrumbs to coat the mozzarella sticks. 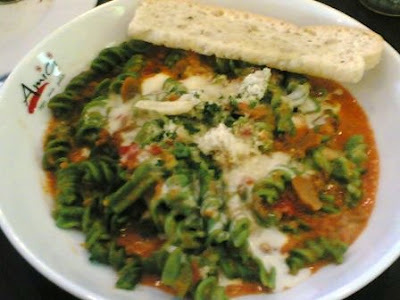 The spinach fusilli was al dente with a generous serving of tomato cream sauce. I wanted to add more cheese to it but you have to pay for extra parmesan cheese. This is the only italian restaurant I know that asks patrons to pay for an extra serving of parmesan. BUMMER!!! 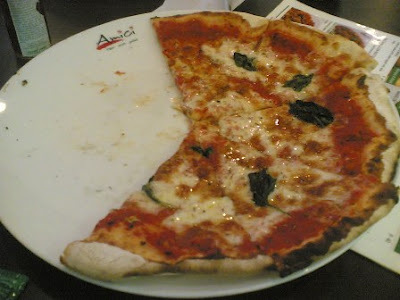 The pizza margherita was crisp and for a lack of a better word, unadulterated. Tomatoes. Mozarella. Basil. Simple. Good. I, however, didn't care for the homemade italian sausage. I didn't like the way it was plated. It was way too oily and didn't taste like italian sausage at all. It was a mediocre version of the ilocos longganisa. 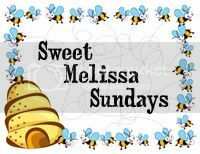 My favorite part of the meal was dessert. 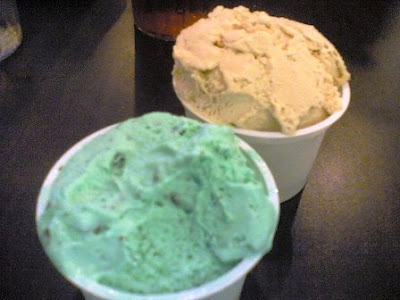 We ordered one scoop each of the hazelnut gelato, mint chocolate chip gelato and espresso gelato. Our favorite was the hazelnut gelato. 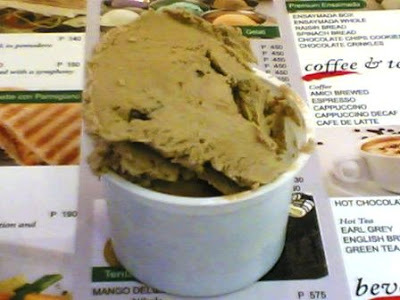 It's like nutella ice cream! The gelato was very creamy and rich and satisfying. My mom bought some ensaimadas as well. Delicious for breakfast. 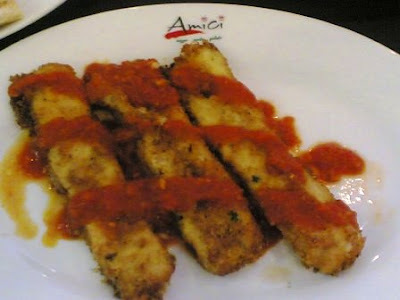 Having said all those, I think that if you don't mind the cafeteria-ish ambience and the long queues, then by all means give Amici a try. The food is inexpensive but good. The ensaimada is soft and tasty and the gelato is YUM YUM YUMMY!